Landlords have always felt that the cost to get rid of the bad tenant was expensive, particularly when often allied to rent arrears and little likelihood of recovering either arrears or costs from the tenant. There also seemed little rhyme nor reason to the high price difference to eviction at Court or on-line. The accelerated possession procedure, following issue of a Section.21 is the most straightforward method and therefore surely the procedure that would lend itself better to on-line proceedings, but this must be done at Court, at a cost of £175. The Section 8, requiring grounds, explanations and particulars of claim can be done at Court at the same cost, or on-line by completion of quite a complex form, at a reduced cost of £100. These costs paled into insignificance when on 22nd April 2014 the charges rose substantially. The cost of Court possessions – for Section 21 or for Section 8 in Court – rose by 60% to £280. The cost increase for a possession claim on-line (PCOL) rose even more extraordinarily by 150%, to £250. Whilst the justification for offering a discount on PCOL was understandable – less staff needed, all the data required in-put by the landlord, so less time taken as procedures were part of one smooth process – it seems difficult to understand why this rise has been so high. Landlords were encouraged to apply for possession on-line, but a £30 discount provides little incentive for landlords to use this method. The only good news (!) is that the Bailiff’s warrant for possession stays at £110. There has been little publicity about the increased charges, possibly in the hope of avoiding a stampede of landlords evicting tenants before the price rise and it is likely that many landlords, unaware of the changes, will turn up at Court and have quite a shock when asked for the money! 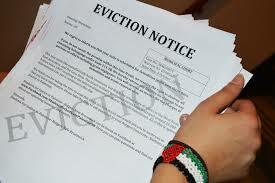 Be the first to comment on "Eviction costs soar"